The system’s multichannel analyzer has 1024 channels, with individual MCAs for the probe and optional well counter. 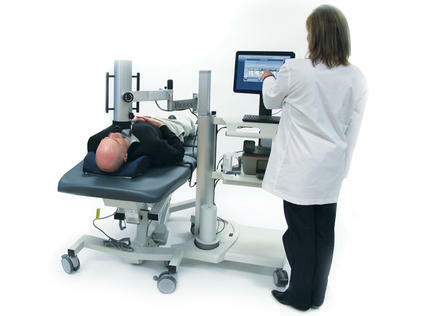 Engineered for mobility, durability and operational efficiency, the Atomlab 960 handles clinical tests, safety compliance tasks, and system administration procedures quickly and accurately. Intuitive menus follow conventionally established nuclear medicine procedures, providing step-by-step guidance throughout all defined procedures. The system automatically performs calculations, stores patient information and test results, and outputs clear, concise reports. User-defined uptake protocols can be initiated. The self-contained Atomlab 960 system is configured on a compact mobile platform with locking casters and a base that measures only 26" w by 34" l (66 x 86.4 cm). An upper shelf supports the flat panel PC with touch-screen display and keyboard. The stand provides convenient storage positions for Neck Phantom, Calibration/Constancy Fixture, and optional well counter. A 2" x 2" NaI(Tl) detector with collimator shield articulates on a ­multi-axis and height adjustable counterbalanced arm. 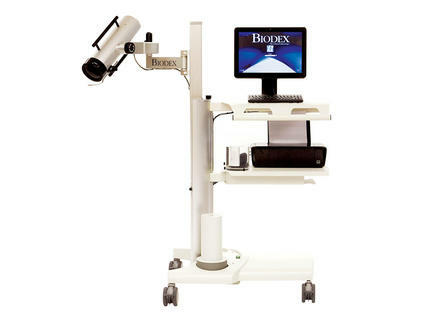 The 24.5" (62.2 cm) of vertical travel allows the probe to be positioned from 30.5 to 55" (77.5 to 139.7 cm) in the horizontal position from the floor to accommodate seated or supine patients. The probe swings more than 180° on the horizontal plane, and extends outward, up to approximately 31" (78.7cm) horizontally from the support column. 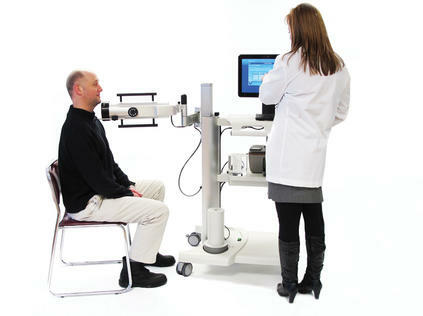 This design makes positioning for uptake studies simple and comfortable for both patient and technologist. The combination of positioning LED and distance measurement rod assures accurate, repeatable patient positioning and uptake measurements. The program displays and stores the full spectrum with each wipe, automatically calculates net contamination levels and reports results in dpm, uCi or Bq. Wipes above the user defined trigger levels are easily identified. A detailed spectrum analysis may also be performed for any wipe to help identify isotopes causing contamination. Customized reports can be printed or saved in PDF format. In addition to providing “standardized” programs for routine test and survey procedures, the 960 has a “manual” program to accommodate other counting and spectrum analysis tasks. The user can select from three counting methods: Preset Time, Preset ROI Counts, and Continuous Counting. After any count, the Spectrum Analysis option can be used to produce a Spectrum Analysis Report. The monitor shows when a test is in progress, and graphically displays the spectrum, time, counts and cpm. Reports can be printed or saved as PDF files. The Bioassay program of the Atomlab 960 allows for the quick and efficient measurement of the staff thyroid burden for I-123, I-125 and I-131. Measurement results can be reported in cpm, dpm, uCi, or Bq. Action levels may be set by the user for each isotope. Report choices include single bioassay report, summary of multiple bioassays on an individual staff member, and summary report on multiple staff members. Reports can easily be printed or saved as PDF files. The optional DICOM Program integrates the Atomlab 960 Thyroid Uptake System with your hospital management system, streamlining workflows and improving communication. The program allows you to retrieve patient information from the worklist and upload patient results, without exiting the clinical software, increasing staff productivity and efficiency. DICOM allows the uptake reports to be transferred, stored and queried/retrieved throughout a facility. Physicians can view both thyroid scans and uptake reports simultaneously. Certification: ETL Listed to AAMI Std. ES 60601-1 3rd Edition and CAN/CSA C22.2. No. 60601-1 and IEC 60601-1 and CE Marked. Learn about the Atomlab™ 960 Thyroid Uptake arm components, how to properly move the probe, obtain uptake information and use the neck phantom to obtain a count standard. 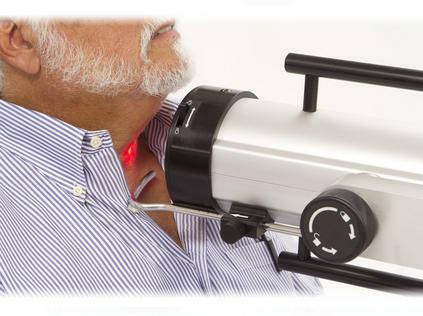 For more information about Thyroid Uptake System accessories including the Neck Phantom, visit www.biodex.com/uptakeaccessories. * Recommended Check Source for calibration of probe and well.